Basic Books, New York, 1975. Paladin, St. Albans, 1977, 344 p.
3. Why a Monk’s Garment? 6. Where Do the Snowflakes Fall? 14. Will IT Be Destroyed? 15. Where Will ONE Return To? 23. Where Did Nansen Go after His Death? 29. What Will You Call It? 32. How Is Your Health? 35. How Do You Say It? 38. Don’t You Believe Me Now? 39. I Never Said a Word . . .
40. Where in the World Are They? 52. Where Is the Mind? 62. Which Is Your Self? 65. What Do You Understand by This? 69. What Do You Have in Mind? 74. Where Is My Rhino? 78. Why Can’t the Tail Go Through? 87. Why Don’t People In Know about Out? 88. Where Is the Old Man Going? 97. Why Is That Thing Not You? 107. What Will You Do after Three or Four Shouts? 111. What Is Your Feeling at This Moment? 115. Is There? Is There? 116. Where Do You Come From? 127. How Can We Go Through Without Interfering? 137. Which One Is Real? "When the Japanese edition of this book, Gendai Sōjizen Hyōron ("A Critique of Present-day Pseudo-Zen"), was first published in 1916, it caused a great sensation. 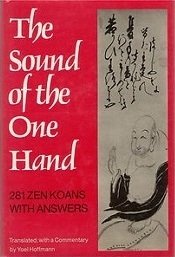 The reason for this lay in the fact that the koans and their answers had been secretly transmitted from master to pupil in the Rinzai sect since the origination of the koan-teaching system in Japan by Zen Master Hakuin (1686-1769). 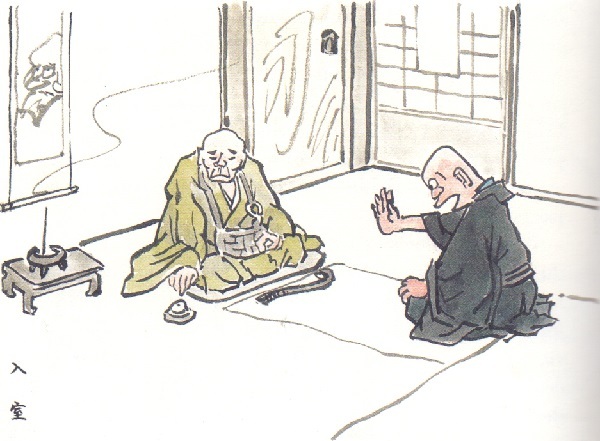 This publication of the "secrets" of Zen seems to have, embarrassed many masters at that time. Furthermore, I have heard that the recent appearance of photocopies of this 1916 edition has caused alarm among Zen masters of today... More than fifty years have passed since the Japanese publication of Gendai Sōjizen Hyōron, which can now be said to deserve the status of a classic of Zen." Excerpts from The Sound of the One Hand, pp. 47-51. Hoffmann, Yoel: Der Ton der einen Hand. Die bisher geheimen Antworten auf die wichtigsten Zen-Koans. 1.Aufl., Otto Wilhelm Barth Verlag, Bern / München / Wien, 1978. 336 S.
Autumn Press, Brookline, Mass., 1977, 128 p.
with comments by the Japanese teacher 白隱慧鶴 Hakuin Ekaku (1686–1769). The present volume consists primarily of an annotated translation of the Kidōgoroku [The sayings of Master Kidō], a text held in very high regard by Zen practitioners. This ancient Chinese masterpiece, together with the later Japanese responses to it, constitutes the final part of the Gendai Sōjizen Hyōron. I wish to draw the attention of the reader to the fact that in Master Kidō's comments to these hundred koans, there are also no secrets. These comments were made known to Zen novices and devotees right from the beginning. I think that they are as close as one can possibly come to a "perfect" answer to a koan, and, in my view, the "secret" answers later appended by Hakuin's school of Japanese Zen were, at best, superfluous. In clapping both hands a sound is heard: what is the sound of the one hand? The pupil faces his master, takes a correct posture, and without a word, thrusts one hand forward. If you've heard the sound of the one hand, prove it. Without a word, the pupil thrusts one hand forward. It's said that if one hears the sound of the one hand, one becomes a Buddha. Well then, how will you do it? After you've become ashes, how will you hear it? What if the one hand is cut by the Suimo Sword (the sharpest of all swords)? "If it can, let me see you do it." So saying, the pupil extends his hand forward. Why can't it cut the one hand? "Because the one hand pervades the universe." Then show me something that contains the universe. The before-birth-one hand, what is it like? The Mt. Fuji-summit-one-hand, what is it like? The pupil shading his eyes with one hand, takes the pose of looking down from the summit of Mt. Fuji and says, "What a splendid view!" naming several places to be seen from Mt. Fuji - or others would name places visible from where they happen to be. Attach a quote to the Mt. Fuji-summit-one-hand. And white flat plains spread into the states of Sei and Jo. Did you hear the sound of the one hand from the back or from the front? Extending one hand, the pupil repeatedly says, "Whether it's from the front or from the back, you can hear it as you please"
"From the back it's caw! caw! [the sound of a crow]. From the front it's chirp, chirp [the sound of a sparrow." Now that you've heard the sound of the one hand, what are you going to do? I'll pull weeds, scrub the floor, and if you're tired, give you a massage. If it's a convenient thing, let me hear it too! Without a word, the pupil slaps his master's face. The one hand - how far will it reach? The pupil places his hand on the floor and says, "This is how far it goes." The before-the-fifteenth-day-one-hand, the after-the-fifteenth-day-one-hand, what's it like? 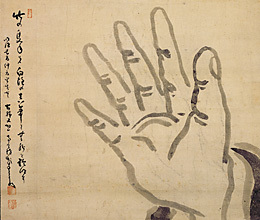 The pupil extends his right hand and says, "This is the before-the-fifteenth-day-one-hand." Extending his left hand he says, "This is the after-the fifteenth-day-one-hand." Bringing his hands together he says, "This is the fifteenth-day-one-hand." The sublime-sound-of-the-one-hand, what is it like? The pupil immediately imitates the sound he happens to hear when sitting in front of his master. That is, if it happens to be raining outside, he imitates the sound of rain, "Pitter-patter"; if at that moment a bird happens to call, he says, "Caw! Caw!" imitating a bird's call. The soundless-voice-of-the-one-hand, what is it like? Without a word, the pupil abruptly stands up, then sits down again, bowing in front of his master. The true-[mental]-sphere-of-the-one-hand, what's it like? "I take it to be as fleeting as a dream or phantom, or as something like an illusory flower. That's how I think of it." The source of the one hand, what is it? "On the plain there is not the slightest breeze that stirs the smallest grain of sand." autumn nights have grown so long." A tanítvány bármely keze ügyébe eső felületen (vagy a levegőben) szétnyom egy nemlétező pókot.